Photokina only takes place once every two years, so there's been much excitement and speculation around the cameras, lenses, photo printers and other photographic tools and accessories announced at Photokina 2012 in Cologne. The show opened to the press yesterday, so TechRadar was of course there to cover all the breaking news and get a first peek at the newest cameras and imaging technology on offer. Here is our constantly updated roundup of some of the key announcements we've seen at Photokina 2012 so far. Canon used Photokina 2012 as a chance to reveal the Canon EOS 6D DSLR and Canon S110, Canon G15 and Canon SX50 compact cameras. The Canon EOS 6D is similar in size and weight to the EOS 60D, making it the world's lightest DSLR to feature a full-frame CMOS sensor. The 20.2 megapixel camera is also the first Canon DSLR to feature Wi-Fi and GPS connectivity, for easy photo sharing. The Canon PowerShot G15 boasts a new, brighter f/1.8-2.8 lens with an extra-wide aperture, while the Canon PowerShot SX50 HS sports an impressive 50x optical zoom. Both high-end compact cameras feature full manual controls and raw image capture. Proving that wireless camera connectivity is a big deal in Canon world, the 12.1MP Canon PowerShot S110 also has Wi-Fi and GPS. Plus it has a new 3-inch PureColor II G capacitive touchscreen with Touch AF for easy focusing when shooting stills or videos, and pinching to zoom in on captured images. Canon also unveiled Project 1709, a new image sharing service that makes it easy to store and access images, regardless of where they have been saved, using the cloud. Photos from the new cameras can be printed on any of the six new photo printers that Canon also revealed at Photokina 2012. 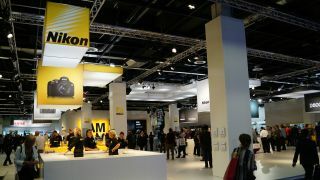 Although Nikon didn't use Photokina 2012 to launch any new cameras or lenses, the show was the first chance the public had to see the new Nikon D600, announced last week. The new 24.3MP DSLR sits below the Nikon D800 in the manufacturer's lineup, and features a newly designed 24.3MP FX format CMOS sensor and the same Expeed 3 processing engine as the one in the top-of the-range Nikon D4. We also got a chance to try out the Nikon P7700, a premium compact camera that features a large 1/1.7-inch 12 million pixel CMOS sensor, a 7.1x optical zoom lens and a fully articulating screen. Olympus introduced two new PEN compact system cameras (CSCs) at Photokina 2012, which both use the sensor from the Olympus OM-D. The new Olympus PEN Lite E-PL5 and new Olympus PEN Mini E-PM2 will sit in the middle and bottom of the PEN lineup, and combine the 16.1 million pixel sensor from the Olympus OM-D with a True Pic VI image processor. They both also feature touchscreens, for easy control. Olympus also announced it has replaced its high-end premium compact camera, the Olympus XZ-1, with the Olympus XZ-2, a new flagship camera for the new range of Stylus compact cameras, which again features a tilting touchscreen. It has a bright zoom lens with a maximum aperture of f/1.8 at the 28mm wide angle end of the lens. It also has a 12.3 million pixel backlit 1/1.7-inch BSI CMOS sensor and 4x optical zoom. Hot on the heels of the Fuji X-E1, announced less than two weeks ago, Fuji revealed a second new premium X series compact camera at Photokina 2012 - the Fuji X-F1. The Fuji X-F1 features the same 2/3-inch EXR-CMOS sensor as the Fuji FinePix X10, plus a newly developed f/1.8 4x optical zoom Fujinon lens, which retracts into the body to give a super-sleek external appearance. Panasonic used Photokina 2012 to unveil the Lumix GH3, to replace the respected Panasonic GH2 at the top of the company's Micro Four Thirds compact system camera (CSC) range. The Panasonic Lumix GH3 couples a new 16MP Live MOS sensor with a new Venus Engine processor in a 550g body. It builds on the impressive video capability of the GH2, by being able to record 1080 50p Full HD Mov video with a bitrate of 50Mbps, or MOV videos at 72Mbps in ALL-I. Leica has decided to omit product numbers on its Leica S and Leica M ranges, announced at Photokina 2012 alongside the Leica V-Lux 4 and Leica D-Lux 6 and new lenses. The Leica S is a medium format camera with a 37.5 megapixel low noise CCD sensor with microlenses and microlens shift. It has an increased buffer memory for increased continuous shooting, upgraded AF, new lenses and is the only Leica camera to feature GPS. It's also very expensive, as Leica cameras tend to be, at £16,000 (around $26,000). The new Leica M boasts a new 24 megapixel full-frame 35mm CMOS sensor, and is the first Leica M camera to include Live View and Full HD video recording. The Leica M-E rangefinder camera includes a full-frame 35mm CCD sensor, boasting 18 million pixels, plus a 230,000 dot 2.5-inch TFT screen and a new leather-style trim. Pitched to the Photokina 2012 audience as an alternative to a DSLR, the Leica V-Lux 4 is a bridge camera with an impressive 24x optical zoom. The compact camera maintains an f/2.8 constant aperture, throughout this zoom range, for shooting in low light conditions. An integrated optical image stabiliser also helps to reduce blur caused by camera shake. Leica's D-Lux 6 is basically Leica's rebadged version of the Panasonic LX7, a compact camera with a wide maximum aperture of f/1.4. Announced at Photokina 2012, a newly developed 1/1.7-inch CMOS sensor is joined by a wide range of features, including fully automatic mode, manual setting modes and Full HD video recording. Like Nikon, Sony hasn't launched any new cameras at Photokina 2012, but it is the first time the public can look at its new products announced last week. The Sony Alpha 99 is the world's first full-frame DSLT camera, and is out on the stands for people to touch and try. With a 24.3 million pixel sensor, the company is hoping to take on the might of Canon and Nikon with its new offering. Meanwhile, the Sony NEX-6, the company's latest compact system camera, is also on display for visitors to get a feel for. Those hoping to take an in-depth peek at the Sony RX1, the world's first compact camera to incorporate a 35mm full-frame sensor, may have been a little disappointed to find prototypes hidden away inside glass cases. Still, you get a feel for how small the device is, and we've seen many interested people milling around the stand. Like Nikon and Sony, Pentax also announced its new cameras ahead of Photokina 2012, so visitors to the German imaging show got their first glimpse of the newly announced Pentax Q10, Pentax K-5 II, Pentax K-5 IIs and new lenses on the stands. Pentax says the new Q10 delivers higher quality images and better AF performance than the Pentax Q, thanks to a new CMOS imaging sensor and an upgraded AF algorithm. The compact system camera has a 1/2.3-inch CMOS sensor with 12.4 million effective pixels, plus a back-illuminated sensor. Pentax hasn't pushed the maximum sensitivity level beyond the ISO 6400 maximum of the Q. The Pentax K-5 II and Pentax K-5 IIs upgrade the premium DSLR, the K-5. Both feature an APS-C format CMOS sensor, 16.3MP resolution, Prime II processing engine, 7fps maximum continuous shooting rate, 77-segment metering, sensor-shifting Shake Reduction system and 0.92x magnification viewfinder. Plus, the AF system has been updated to a SAFOX X AF module, which has a sensitivity range of -3 EV to +18 EV, for better autofocus. On the new lenses front, the smc Pentax-DA 18-270mm F3.5-6.3 ED SDM is a 15x zoom lens that has an effective focal length range of 27.5-414mm. Pentax has also announced the HD Pentax-DA 560mm f/5.6 ED AW, a telephoto lens with a 35mm focal length equivalent of an 859mm lens on a Pentax DSLR. Samsung used Photokina 2012 to announce two new lenses in its NX range of compact system cameras (CSCs) and accessories, to fit the NX20, NX210 and NX1000, expanding the number of NX lenses up to 11. The 12-24mm f/4-5.6 ED ultra-wide zoom lens and 45mm f/1.8 mid-telephoto prime lens are extremely lightweight, and are compatible with Samsung's i-Function system, which enables you to easily adjust shutter speed, aperture and ISO settings. Samsung was also keen to talk about its Galaxy Camera, launched at IFA 2012 in August, with Nick White, head of digital imaging, saying: "By announcing two new NX lenses and the innovative GALAXY Camera, Samsung has continued its commitment to both innovation and capturing high quality photographs". Sigma told the crowd at Photokina 2012 that it's released new lenses and reorganised its lens lineup. The Sigma 17-70 f/2.8-4 DC Macro OS HSM lens is the first new lens for the Contemporary category. Mainly designed for general purpose photography, the lens gives equivalent focal lengths of 25.5-105mm on a 35mm camera. In the Sports category, there's a new Sigma 120-300mm f/2.8 DG OSM lens, which is dust and moisture-resistant, for use in harsh shooting conditions. Multi-layer coating again reduces flare and ghosting and provides high contrast images even in backlit conditions. Hasselblad unveiled plans for its Lunar compact system camera (CSC) at Photokina 2012, which currently exists in around 30 different versions. As yet the company doesn't know exactly which ones will make it to market as the final production version. We do that the camera has a 24.3MP APS-C format sensor, 25 AF points and is able to capture both still imagess and video. Images can also be shot at up to 10fps, with sensitivity settings running from ISO 100-16000. If you want to have your say on the photography treats revealed so far - and those not announced yet - hit us up on Twitter (@TR_Cameras) or Facebook and let us know what's on your wishlist.